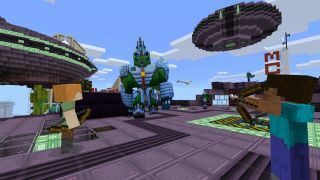 As popular as the game is on consoles, PCs and mobile devices, Minecraft wasn’t widely loved on the Apple TV, according to the game’s developer, Mojang, which stopped supporting the game on September 24. The news is disheartening for those of us who remember Tim Cook’s announcement for Apple TV support for the game back in 2016. However, what's possibly even worse is how this bodes for the Apple TV as a micro gaming console. Is this 'game over' for the Apple TV? As more and more developers leave - or, worse, forego - Apple TV, the platform might have a harder time justifying its exorbitant price tag while simultaneously sending gamers to other micro consoles with a more lively game scene. Take the Nvidia Shield, for instance, which was successful enough to warrant a second version last year and supports streaming via its GameStream and GeForce Now services. That being said, while Apple hasn't had the best of luck convincing gamers to join its micro console revolution, the company can rest easy at night knowing that it's still the world's largest digital storefront for mobile games.